Today, the making of silhouettes is synonymous with paper cutting. However, this was not always so. Silhouettists of the past were intent on the capturing of shadows, the medium was secondary to this end. 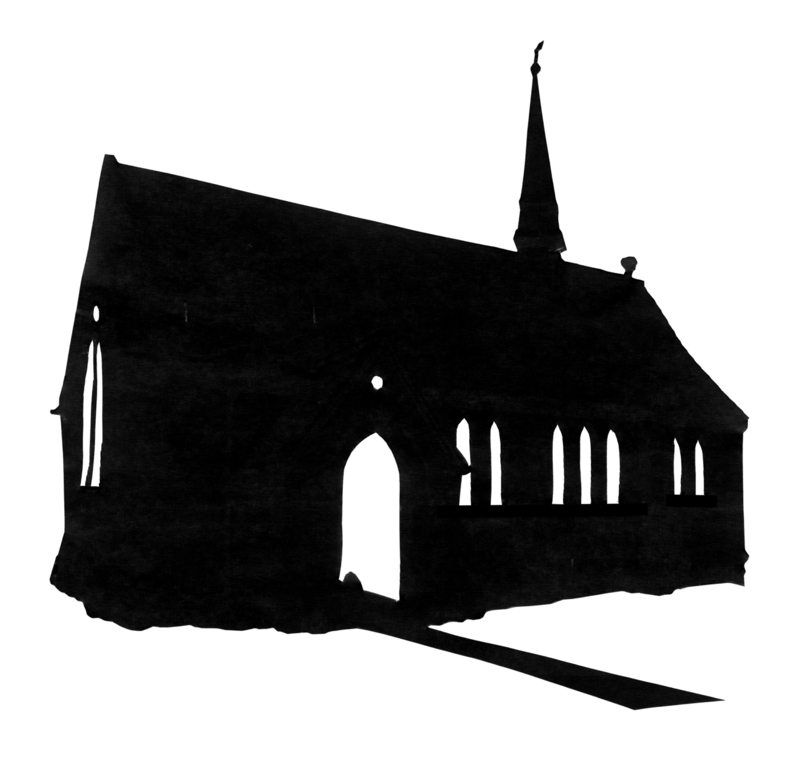 A silhouettist could be a paper cutter, but could also be a watercolourist, a painter on glass or plaster, or even a photographer. Quite often they were all these things and often mixed a variety of media in pursuit of their goal. It was not uncommon for an artist to begin by cutting a shape in black and then continue by adding watercolour details around the edges or adding fine detail in ink. 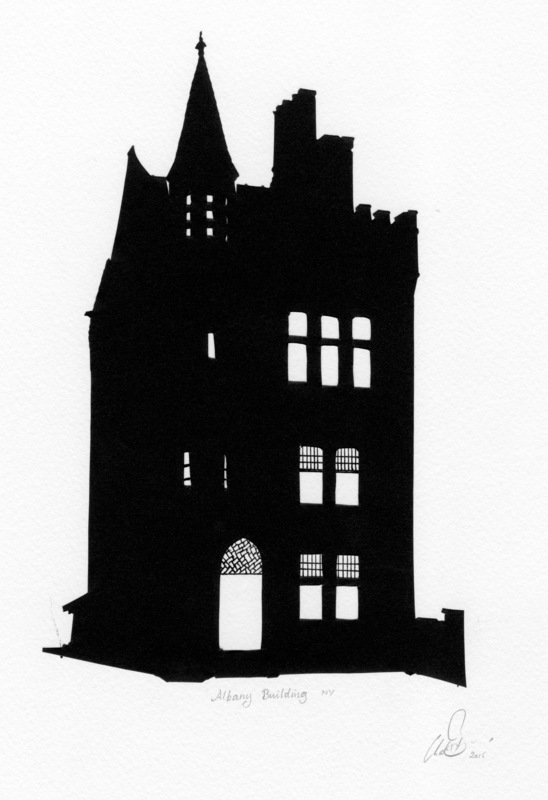 This year I’ve been making silhouettes of a number of buildings. These have mostly been for wedding clients who have asked me to cut a silhouette of their venue. They can be as simple as a small country church or as complex as the silhouette of Old Billingsgate market. When I searched for silhouette buildings the choice offered seemed to me rather dire. They generally come in two styles: some are all-black city skylines in which the ground merges with the buildings, others are architectural elevations with windows and architraves picked out in white. 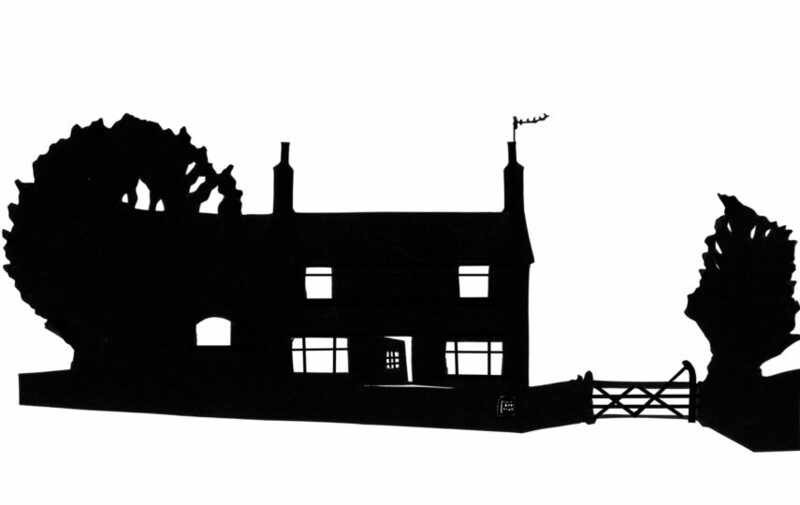 I wanted to create a more hand-made style for my own silhouette buildings, one which embraced the feeling of scissor-cut paper. I also wanted to cut away the ground on which the building stands more creatively than making a straight-line edge. I wanted something with a bit more life than a simple outline shape. After a number of experiments I settled on my own approach to the subject, which I’d like to share. Firstly, I cut all, or most of the windows out. This has the effect of making the building seem lit from within, as if somebody turned all the lights on. My idea was to create the impression of a big event going on inside, but some people have commented that it creates a slightly haunted-house feeling! The windows add a level of detail and interest, but they are hard to cut with scissors. I need to cut each window pane! This is time-consuming and awkward, and tends to produce irregular results. Although the scissor-cut outline works well for me, I want the windows to be neat and regular. My solution is a mixed-media approach. I cut the outline and windows with scissors and then draw in the window panes and other details using ink and a ruler. A scissor cutting with window-pane lines added in ink. Gradually I’ve become fond of this way of working and am keen to do more. 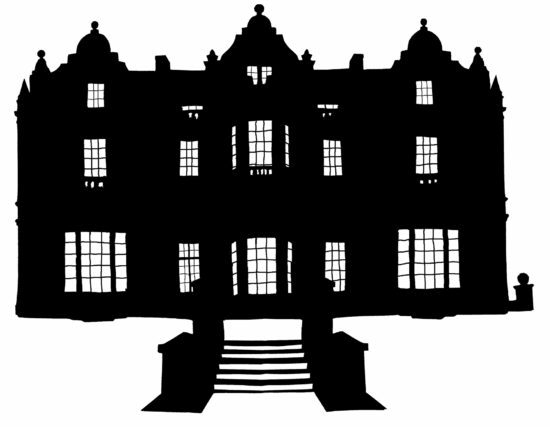 All the silhouette buildings I’ve cut so far have been venues of events where I’ve been working. However, there may be a wider application. Do you live or work in a building which might benefit from this treatment? If so, perhaps you’d like to commission its silhouette. The amount of work varies from building to building. It’s much faster for me to cut a well-loved garden shed than the silhouette of Great Fosters! So the first stage in the process is for the client to send some photographs of the building, to give me an idea of what’s involved. We then agree a fee. Next I choose the best view and carry out some initial work in Photoshop (correcting distortions in the photograph and removing distractions) to arrive at an image I can use as a basis for cutting. I send this to the client for approval before I begin. This discussion with the client, to arrive at the basis for cutting, is important. One of the limitations of cutting paper is that it’s very hard (if not impossible) to make alterations. If a silhouette doesn’t work the only option is to throw it away and start again. For this reason my aim is to get it right first time. Left: Leighton House, London, built by pre-Raphaelite painter Lord Leighton. Right: Checking the silhouette on the backing card before a wedding. Too late to make changes. Did I get it right? I can supply the finished silhouette either as a digital file (if commissioned for illustration) or signed and mounted on watercolour paper ready for framing, or both. The Albany Building, New York. Black paper and ink on watercolour paper, signed and ready for framing. I’m beginning to feel that this body of silhouette buildings could form the basis of an interesting exhibition. For that reason I’m looking for interesting buildings which might lend themselves to silhouette. Buildings in the City of London – the silhouette of old and new, some of them might be somewhat tedious with all the glass, BUT the shapes compared with some of the churches, Royal Exchange, Mansion House, South Gate at St Bartholomew’s etc would make an interesting contrast. Happy to walk with you to point them out. Yes, this would be fun.